The first thing you should do is take a gander at your outdoor space and envision what you would like this area to be used for. Are you thinking cook-outs and beer pong? Or maybe you’d like a conversation area where you can host the monthly book-club or invite the neighbors over for a little wine testing. The right patio furniture is what is right for you, whether it is aluminum, wood or wicker it has to fit your needs, your lifestyle and your budget. Outdoor furniture offers all the same options indoor furniture has; dining tables, dining chairs, sectionals, sofas, settees, end tables, stools – it’s all out there in every shape, material and color you can imagine. Approach your outdoor patio furniture the same way you approach your indoor furniture; choose your colors, define and measure your space, determine your budget and then shop, shop and shop some more. Find those pieces and collections that make you smile, that fit your vision; that will create a space that invites you in and encourages you and your guests to linger. Whatever your pleasure, whether it be a quite afternoon curled up in the shade with your kindle or hosting a neighborhood luau, you will want outdoor furniture that is well-made and comfortable just like your indoor furniture. Add bright and funky Liora Manne throw pillows. Fun, imaginative designs for outdoor use. A beautiful Outdoor Rug will pull your look together. Include some beautiful water lilies, sand and surf or the Tuscan countryside with Outdoor Wall Art. Plant some fabulous annuals – check The Farmer’s Almanac for advice on how, when and where to plant your flowers for the best results. Buy a vibrant umbrella! Red and blue are the new neutrals; or look for a spectacular stripe or patterned cover from Treasure Garden. How cut are these? Crooked Playhouses (pictured above right) in bright colors for your little angels! Add a Water Fountain or water feature to your backyard. Rock owls. I love rock owls. So what if they are just rocks with eyes? They are adorable and whimsical and will make your guests (and you) smile. Placemats! Many design groups will make yours to order out of Sunbrella outdoor fabric. Ceramics garden stools. These imports from the East are a perfect pop of color anywhere. Use as an end table, extra seating, or an object d’art. Stick one in your garden. Gorgeous! Another fun and decorative idea from the East – rain chains! Replace an unattractive gutter downspout and create a beautiful a water feature that produces soothing sounds to boot. Liven up a small space or cranny with a Margarita 3 Pieces Bistro Hawaiian Blue Set from Alfresco. A delightful daisy design. Available in three bold and beautiful colors, blue (above), Blood Orange and Green Apple. How do you keep Spot off your brand new Patio Furniture? One way might be to get him his own. Several casual furniture companies are now producing pet beds to match or complement your outdoor furniture and decor. You can go all out with an all-weather wicker dog house like the four seasons pet shelter or go Cleopatra with the coastal pet bed. 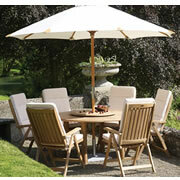 Great patio furniture brings comfort and function to your outdoor spaces. With a spacious table and easy to use, comfortable chairs a basic brick patio is transformed into a sensory-rich dining destination. Outfit a cozy porch with a wicker sofa and a classic wicker rocking chair, both stocked with ample cushion, and the porch will quickly become a second family room during the warm weather months. Don’t overlook the outdoor-living opportunities on balconies and in pocket gardens. When complemented with then right patio furniture, these petite garden getaways will beckon you outside time and again. Check out the following tips for choosing the best patio furniture for your space. Thoughtful planning will ensure that your outdoor living space is inviting for years to come. Make a List, begin by thinking about how you would like your outdoor space to function. Would you like it to serve as a dining area on warm summer nights? Would you like to host your next dinner party or your daughter’s birthday party in the space? Is a peaceful reading nook more of what you are looking for in your outdoor room? Make a list of the many things you would like to do in the space and use it as a guide to determine what type of furniture is necessary. If the primary function of your 12×16-foot patio is to host casual evening cocktails, there is no need for a dining table. Opt for sample comfortable seating, several side tables, and fire pit. Take a Seat, before buying furniture you should take a seat. Comfortable patio furniture, just like interior furniture, will be used regularly as opposed to uninviting patio furniture, which might have good looks but no-so-good comfort. Go for Easy Care, reserve the bulk of your garden-side hours for enjoying your space as opposed to maintaining furniture when you purchase easy-care patio furniture. Most metal, teak, cedar, and all-weather wicker pieces are unfazed by whatever nature throws their way. Furniture made using these forgiving materials will look wonderful for years. Consider Storage, add years to the life of your patio furniture by storing it in a protected location, such as a garage or basement during the off season. Even the toughest furniture, such as teak chairs or a wrought-iron settee, will last longer if it is placed in storage when not in use. 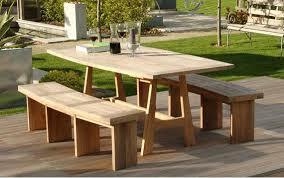 If your storage space is limited, look for patio furniture that folds or is easily taken apart for compact storage. Color Smart, when purchasing patio furniture, you are not limited to the natural tones of wood; the black, white, and beige of wicker; or metal pieces. Colorful finishes abound in the world of outdoor furniture. For stylish longevity, reserve bold splashes of color for cushions and accent pieces. Invest in Quality, the old adage “you get what you pay for” is true for patio furniture. Plastic resin chairs or side tables look great on the shelf and will keep their good looks for a year or two out in the sun, but in time they will become brittle and lose their vibrant coloring. The same is true for some wood products and wicker pieces. Shop with care, checking consumer reports and reviews before making a big purchase. Look Underfoot, ground patio furniture by placing it on an all-weather rug. Textile advancements in recent years have brought many quick-drying outdoor rugs to the market. Soft underfoot and rich in texture, an outdoor rug will lend the comforts of indoors to the great outdoors. Search for Dual-Purpose Pieces, look for hardworking furniture. An ottoman that doubles as extra seating for your next backyard bash and a simple bench that will stand alone or cozy up to an alfresco dining table are essential for frequently used outdoor spa. During the summer months, your outdoor patio furniture gets a lot of use. If you live in a place that has a cold or wet climate in the winter, you will need to make sure that your patio furniture is properly protected from damage. The days are getting shorter, and there is a chill in the air. Now that you are not spending as much time outdoors, it is time to prepare your furniture for the winter months ahead. With outdoor living spaces becoming more popular than ever, most people have at least a few pieces that need to be stored. Even furniture that is treated to be weather-resistant or is under a patio cover needs to be cared for and maintained. Spend a bit of time now, and you will be able to enjoy your outdoor living area when spring rolls around- and your furniture will be in top shape. The most important step in preparing furniture for storage is to get it clean. Moisture and dirt left on outdoor items can cause mold or mildew to grow in the winter months. Mold can grow and spread quickly, leaving your furniture in bad shape by the time you are ready to use it again. Pieces made from wicker, wrought-iron, mesh or plastic can be cleaned with a simple dish soap and water solution. For wood furniture you can use Murphy Oil Soap and water, then rinse and let dry. If there are stains that are difficult to remove, make a mixture of 1 cup ammonia, 1/2 cup vinegar, 1/4 cup baking soda and 1 gallon water. Use a soft brush to work on the stains, then rinse and let dry completely. Take time to work on stains now, to prevent problems in the spring. Cushions also need to be clean and dry before you put them away for the winter. If you have cushions covered in fabric or canvas, prepare a solution of 1/2 cup Lysol and 1 gallon hot water and use a soft brush to scrub them clean. Rinse cushions thoroughly and let dry.